At the heart of virtually every problem in the church, at the bottom of every strained relationship, at the center of every reason an inactive member stays home on Sunday or leaves the LCMS is the issue of the proper distinguishing between the Law and the Gospel. Without this understanding, the Scriptures make no sense, we will have no idea why we go to church (or worse, the wrong idea) and we will have no clue as to why orthodox Lutheranism reflects New Testament Christianity in the best sense. We may well be a royal pain and terror to those around us. Even worse, without a clear understanding of Law and Gospel, we’ll be of no use to people around us struggling with spiritual and life issues. Worse still, we may even become a millstone round their necks, helping them (and ourselves) on the way to hell! 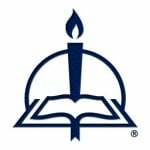 The Lutheran Reformation began when the Lord God Himself, through the Scriptures, opened Luther’s mind to the scriptural distinction between the Law and the Gospel. The Law makes demands, which we could not, cannot and never will fulfill. “No one is righteous, no not one” (Romans 3:10). “Even our righteous deeds are as filthy rags” (Isaiah 64:6). “The wages of sin is death” (Romans 6:23). If St. Paul laments about himself, “The good that I would do I do not do” (Romans 7:19), where does that leave you? You have not a thought, an action or any of your physical, psychological or spiritual being that is not affected by and tainted by the reality of sin. And sin damns. The Gospel, however, makes no demands and even gives the faith needed to believe it (Ephesians 2:8–9). The Gospel is the forgiveness of sins. Christ was slain from the foundation of the world for you (Matthew 25:34). Christ was prophesied in the Old Testament for you (Isaiah 53). Christ was conceived for you (Luke 1:26). Christ was born for you (Luke 2). Christ was circumcised and fulfilled the Old Testament ceremonial law for you (Luke 2:22). The boy Christ taught in the temple for you! (You get the credit for His diligence in the catechism! See Luke 2:41.) John the Baptizer pointed to Jesus, saying, “Behold, the Lamb of God, who takes away the sin of the world!” (John 1:29)—for you. Jesus was baptized for you (Luke 3:21). Jesus was tempted for you (Luke 4). All of Jesus’ miracles, healings, words, promises, His Passion, His trials, His beating, His betrayal, His crucifixion, His ridicule, His words on the cross—“Forgive them, Lord, for they know not what they do!” (Luke 23:34); “Today you will be with me in paradise!” (Luke 23:43)—His death, His descent in victory to hell and His glorious resurrection and ascension are all, all of it, for you! And that’s all Gospel! But there is even better news, and this is the point where the devil bedevils us. What Jesus attained for us some 6,000 miles away and 2,000 years ago is delivered in the word of preaching, in Baptism, in absolution and in the Supper. “I don’t need to go to church to be a Christian.” Oh, yeah? God says you do. “Do not give up meeting together.” (See all of Hebrews 10.) But better than the Law (which says you should go to church) is the blessed Gospel! We cry like the tax collector at church, “God, be merciful to me, a sinner!” (Luke 18:13). And the pastor says, “In the stead and by the command of Christ, forgiven!” (see John 20:21–23). He makes the sign of the cross to remind us that we’re baptized, forgiven (Titus 3:5). The Scriptures are read, and they contain both Law (demand, threat) and Gospel (forgiveness, promise). The sermon is preached, and the texts explained. The Law threatens and drives us to Jesus! The Gospel is not merely described or spoken about, it’s delivered! “The gospel is the power of God unto salvation” (Romans 1:16), right now, for you! Most people who stop going to church or get church wrong think it’s about ethics. They think it’s about following the rules (i.e., following the Law). No, it’s finally about sinners receiving forgiveness (Gospel). And blessed by the Benediction (“The Lord bless you and keep you! The Lord make His face shine upon you and be gracious to you”—Gospel!) and all the forgiveness given, forgiven sinners head back into their vocations in life to be a beautiful leaven. If I know I’m a real “hard-boiled sinner” who’s been forgiven (Luther), I cannot be an unforgiving jackass to those around me. It’s a matter of Law and Gospel. I cannot but speak forgiveness—the Lord’s own forgiveness—to others. From Letters from a Pastor’s Heart, pages 25–26 © 2016 The Lutheran Church—Missouri Synod. Published by Concordia Publishing House. All rights reserved. 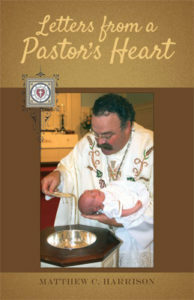 To order Letters from a Pastor’s Heart, please contact CPH at 800-325-3040 or visit www.cph.org.